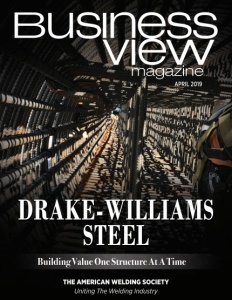 Business View Magazine interviews Sean McGahan, President of Shamrock Steel, Inc., as part of our focus on best practices in the construction supply sector. Shamrock Steel’s success as a small player in a niche market is the result of determination, business savvy, good old hard work, and – just maybe – a wee bit of the luck o’ the Irish. Regardless, this is one entity that is literally turning heads. Now entering its 21st year of operation, Shamrock Steel has become a go-to provider of tank heads, circular blanks, and custom steel plate shapes for companies from coast to coast, all supplied from its headquarters in Birmingham, Alabama. Sean McGahan is the affable Owner and President of Shamrock Steel, Inc. Business View Magazine recently spoke with him about how the firm has survived and thrived with just a slim product line, and its role today as a trusted name in the tank head sector. The following is an edited transcript of that conversation. BVM: What was the impetus behind the formation of Shamrock Steel? McGahan: “I was lucky to have parents that encouraged me to be my own boss from an early age. I look back at an essay I wrote in maybe 2nd or 3rd grade where I wrote, ‘I want to be an entrepreneur.’ I don’t think I even knew what that meant – obviously, I was being brainwashed, but in a good way! My dad had a tank head company years ago, and I worked for him right out of school and got some great experience there. Then he sold that company, which I encouraged him to do because I wanted to try different things. I worked for a scrap metal company, first, then started my own little advertising business. After three years of that, my wife said, ‘You need to make more money.’ She was right, it wasn’t working out. And that is when I called Ken. BVM: How did the company evolve after that? McGahan: “There are different types of tank heads: pressure-vessel types that are dome-shaped and flat ones, what we call in the industry ‘flanged-only’ type heads. They’re the least expensive and don’t hold pressure. I started out just making those, even though it wasn’t easy the first few years. The company I left thought I was crazy to go that route, but I loved every minute of it. In the morning I’d do my sales, and in the afternoon I’d get dirty making heads in the shop. “I was pretty much a one-man band with a part-time helper. That’s not the way I envisioned it when I started – I thought it would be a lot more glamorous. But with my dad’s experience in the business, he was very helpful scouting my first location and helping me get started. The first place I rented was only a 30 x 30 ft. space, which was not ideal, because I had to store all my steel outside, but it was all I could afford. I figured it would take three years to make a profit; it actually took about five. But I was able to hang in there. In the fourth year, we turned the corner and I was able to hire my first full-time person, Jay Adams. Jay and I worked together in the shop for a year or so, and then I hired another guy and finally got myself out of the shop. After that, I was able to do more travelling, see more clients, get more business, and Shamrock Steel really took off. BVM: What products and services do you provide? McGahan: “Our raw material is flat steel plate. I sell tank heads, but I’m mostly selling service, so my supply chain is very important. I buy directly from steel mills and also from steel distributors – middle men that buy from the mills and then sell to guys like me. Delivery from the domestic mills is usually about three months. I keep just over a million dollars worth of tank head inventory on the floor, which is really what I’m providing my customers. I carry the inventory burden, so customers don’t have to. They can call me and place an order on short notice for a mixed load and be pretty confident I can get it to them within a week or two. BVM: Who are your main customers? BVM: How would you sum up the best attributes of Shamrock Steel and what are your company’s goals for the future? McGahan: “The steel industry is very ‘green’ in that nothing is ever thrown away; it’s always recycled as scrap, and that’s a source of pride for all of us in the steel industry. We sell our ‘leftovers’ to a scrap company, they sell it to a steel mill, and maybe it comes back to me some day in the form of plate. We were recycling when recycling wasn’t ‘cool’ and I like that. “For the future, my goal is to continue working for as long as I possibly can. I feel obligated to my customers to keep it going for them, because I know there are many people relying on the service Shamrock Steel provides. I like making my customers’ lives easier. I purchase a lot of products myself, so I feel their pain when things aren’t on time.